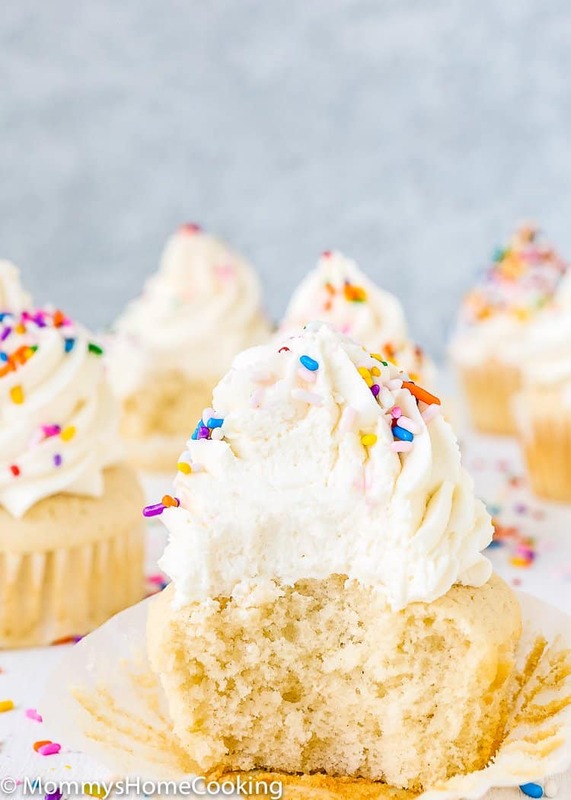 These fluffy and moist Eggless Vanilla Cupcakes are super easy to make with just a few ingredients. This is the recipe you have been looking for! 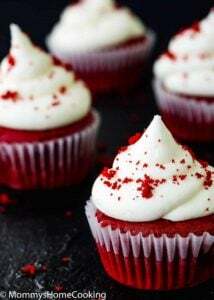 Who doesn’t love classic cupcakes? 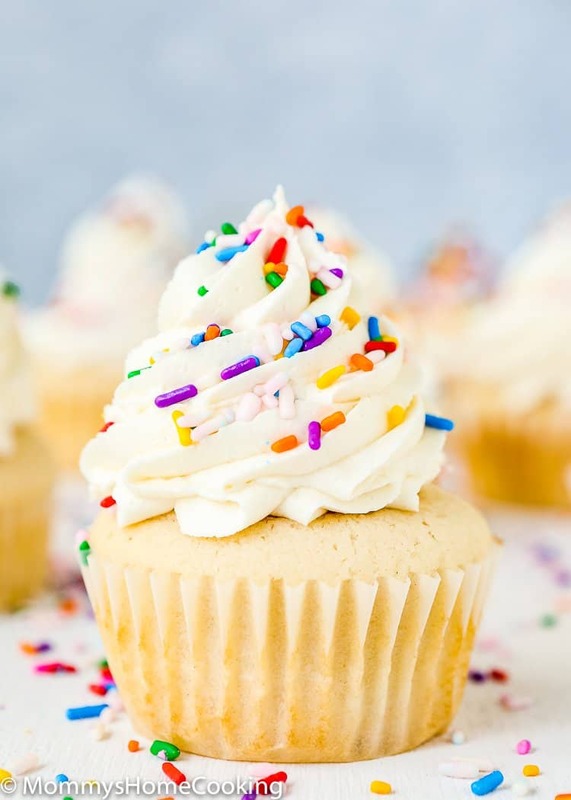 These Eggless Vanilla Cupcakes are tender, moist, and well… D.E.L.I.C.I.O.U.S!!! 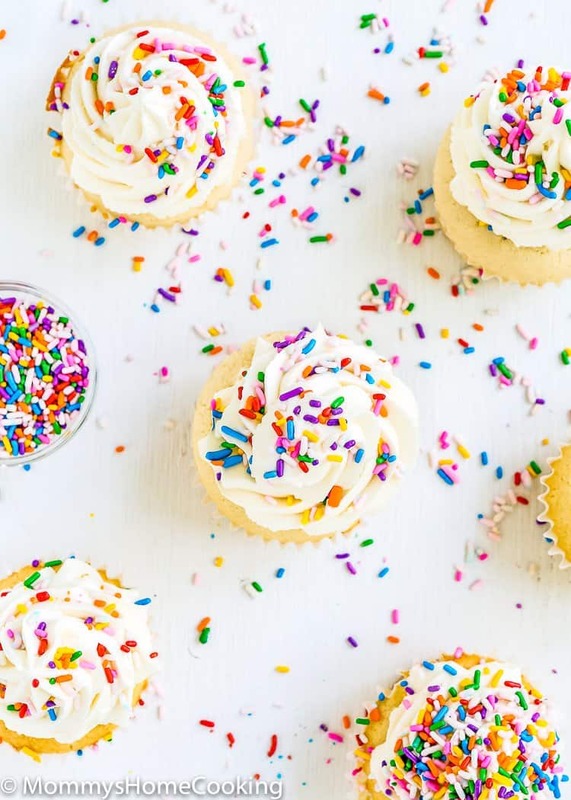 They are the perfect addition to any birthdays, school parties, celebrations, and I-want-a-cupcake days. They just take just minutes to make these from scratch, with ingredients you likely have in your pantry. Our little girl turned 5 a few days ago, and we have come a long way after her first allergic reaction to eggs when she turned 1. 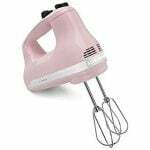 I have tested dozens, if not hundreds, of recipes, which include cakes, cupcakes, muffins, donuts, cookies, etc., I have used all the egg replacements I have heard or read of. Anyway, every time I get a new recipe idea in my head, the first thing I think is if I can do it without an egg. I am not going to lie; some time is extremely frustrating. 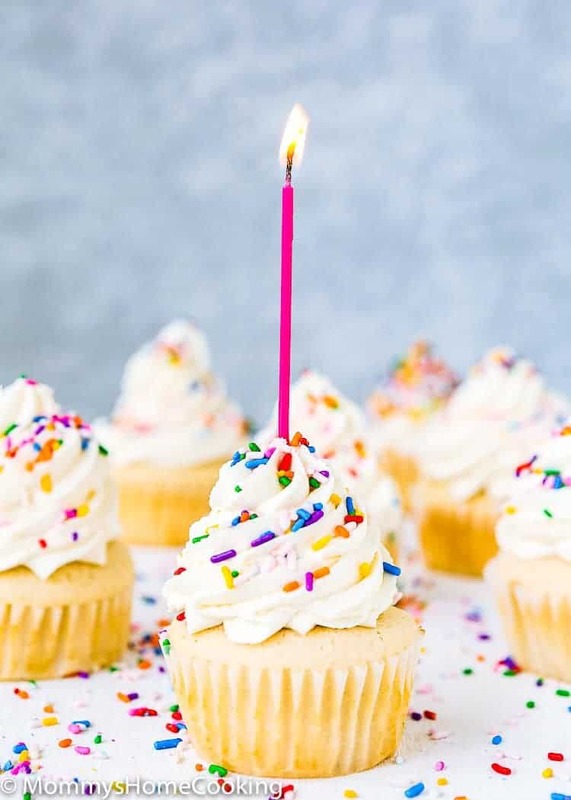 Today I can say happily that egg allergy is not, nor has been a limiting factor for my daughter to enjoy all her favorite food: pancakes, waffles, cupcakes, cakes, etc. Yeap!!! She inherited my taste for sweets. 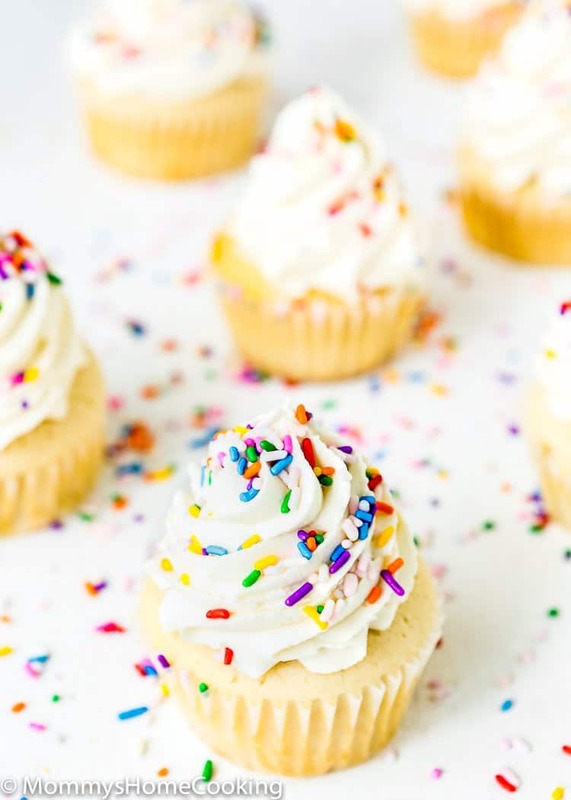 These Eggless Vanilla Cupcakes are incredibly fluffy and bursting with golden buttery flavor. 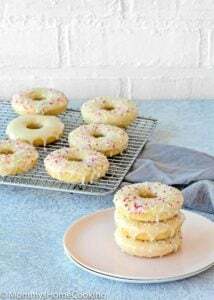 For the frosting, I made vanilla buttercream from scratch, but you can use anything. If you or your little one is into Nutella, I highly recommend trying my Nutella buttercream. YUM. Sprinkles are NOT optional around here. Actually, the more sprinkles the better. If you have a little one with egg allergy, you know that birthday and school parties are stressful events. 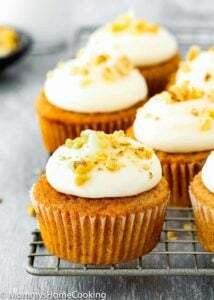 Make a batch of these Eggless Vanilla Cupcakes. Wrap cupcakes tightly in plastic wrap. Place individually-wrapped cupcakes in a plastic double zipper quart freezer bags. To defrost, unwrap cupcakes and bring them to room temperature. Frost to your liking. 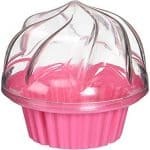 When my daughter has to attend a birthday or school party I defrost a cupcake, add some icing and lots of sprinkles, of course, and pack it in this super convenient and cute cupcake container. Don’t they look fabulous inside? These aren’t just cupcakes for kids. Sure, your kiddos will devour them. But grown-ups alike will appreciate them too. In a large bowl, beat the sugar and butter until creamy and pale. Add vanilla and mix to combine. Combine milk and vinegar in a small bowl. Add the flour alternately with milk, beginning and ending with the flour mixture; beat until smooth. 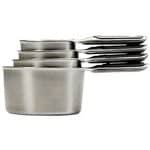 Bake for 18-22 minutes, or until a toothpick inserted in the center comes out clean. 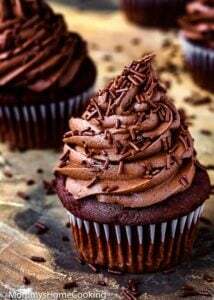 IMPORTANT: these cupcakes won't brown as the cupcakes made with eggs, so when you see the top set check the cupcakes for doneness with the toothpick test. Let them cool in the pan for a couple minutes, then remove. Allow cooling completely before frosting. Thanks for this! Turned out fine apart from I wasn’t clear if I was meant to put the milk into the sugar and butter mix first or the flour and then the milk. So I put the milk in first and it curdled because of the apple vinegar of course and was worried it was ruined. Luckily it turned out fine. For when I next make a batch, do I put the flour in first and then the milk? Hey! I just made your eggless cupcakes. They taste great but they fell apart in the cupcake pans as I went to take them out after they cooled. They didn’t stay whole. Any tips? Has this happened to you before? I didn’t change anything from the recipe. 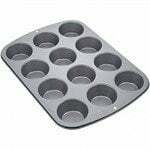 Do you think I should use cupcake holders in the oven? I just buttered the lining. I’ve made these cupcakes twice. The first time with almond milk & they were so thick, more like a scone than a cupcake so the second time I added used coconut milk & used about a cup & a half of the milk, and this time they were too fluffy. I guess I overfilled the cups too because they overflowed but then fell when they cooled. They’re almost too fluffy this time. Hope I can get it right by my son’s birthday in 3 weeks. Any tips or ticks? Hello Theresa! Just plain milk work perfect every time. Next time make sure to measure the ingredients properly and don’t overmix the batter. Hope this help. Thanks for trying my recipe. Thank you for all the yummy eggless recipes. Since finding out my daughter had an egg allergy I’ve been struggling to find eggless recipes that actually tastes good! I’m very glad I found your website! Hello Rebecca! I am very happy you find my eggless recipes useful. Be sure to shout out if you have any questions! So this a a bit of a weird question but, if I were to make a half more of this recipe, not doubled but like just a half more, how much flour would I need? Hello Netta! 2 1/4 cup of flour. Hope this help. Just wondering if you used caster sugar ? Which sugar do you suggest ? Longham Pre-School children made your eggless cupcakes today for Valentine’s Day. They turned out AMAZING!!! 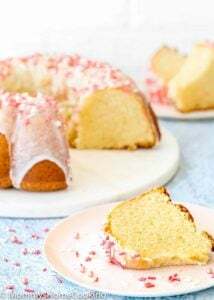 We needed an eggless recipe for a child with a severe allergy. Hello Kelly! This made me so happy. I saw the beautiful cupcake pictures you sent me via Facebook. Thanks so much for your feedback and for trying my recipe.